When you saw Kim K’s clear, acrylic, makeup storage on “Keeping Up with the Kardashians” it was love. Everything looks so organised and was visible from every, and any, angle. But what’s not to love? 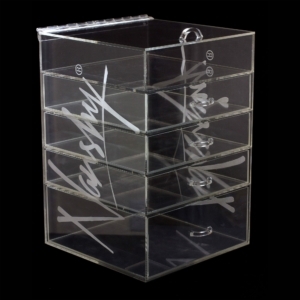 K-dash’s clear acrylic make-up organiser measures 12”x12”x15” (30.5 cm x 30.5 cm x 38 cm) and it also has no drawer pulls. Instead it has flat cubes you need to pinch instead of grab to pull open. It also costs over $300 USD (£183.50)!!! At Nanshy, we’ve improved upon everything. First the size, instead of only 30x30x38, The Prestige is 30cm x 30cm x 44cm. That’s over 39,500cm of makeup and accessory storage! The additional height is where you need it most, the bottom drawer (a large 11,5cm deep) for larger, heavier items, and the flip-open cubby top. The top is designed to be kept open as a deep-edged holder (7 cm) or closed top bin. You can have its lid open or closed at any time, drawers out or in. Use it to hold all of your fragrances and ‘quick-reach’ items. No more scrambling around, digging through drawers and bags causing you to rush out the door because you used up ready-time not finding your makeup and jewellery like you planned. 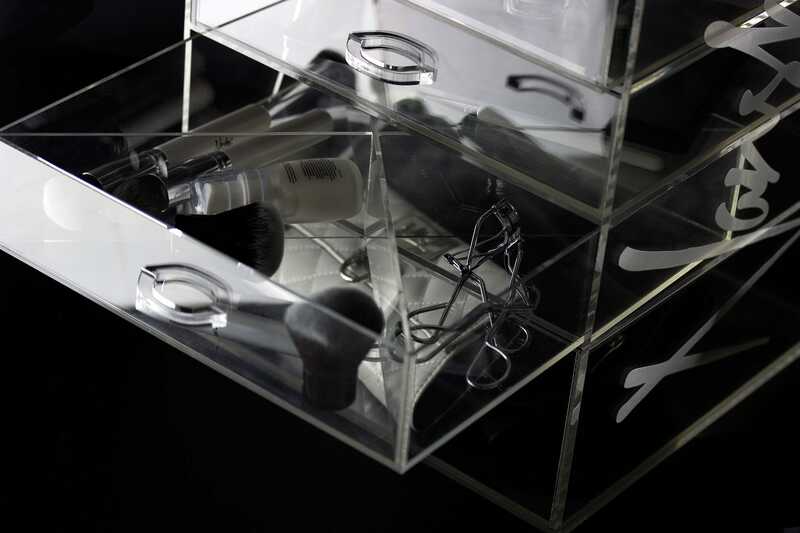 No matter what your beauty organisational needs are, the Prestige Acrylic Cosmetic and Jewellery Storage Box is clearly* the most practical, versatile, and couture choice! *Pun intended -The Nanshy Acrylic Storage Box is noted to be the most invisible and pristine acrylic makeup organiser on the market today. Easy to keep clean! Simply wipe down with a damp cloth, then buff dry with a dry cloth to keep it sparkling like new! The meticulously detailed craftsmanship and invisibility blends seamlessly with any decor. No matter where you put it, on your bathroom counter, your vanity, dresser or table, it will match and turn into your own personal little diva makeup center! Additional features that not even Kim K has, that you will? – A top handle for the upper compartment for easy one-handed opening, even with something in that hand! Dividers, Nanshy Acrylic Storage Boxes accept two pairs of drawer dividers for your smaller items. 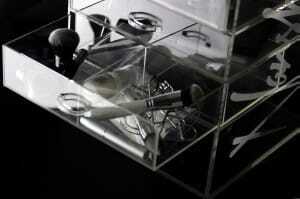 One pair forms an ‘X’ for 4 triangle shaped compartments in a drawer. The second pair forms a cross-shape to create 4 square shaped compartments in a drawer. Or if you want open space, the four dividers come apart and can be stored inside at the back of the Nanshy Prestige, out of the way but easy to find when suddenly needed. 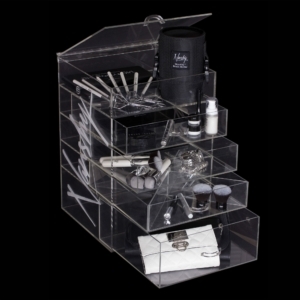 The Nanshy Prestige Acrylic Cosmetic and Jewellery Storage Box Clear Makeup Organizer – IS A UK EXCLUSIVE! We will only ship to addresses in the UK. It will arrive securely packaged and safely to you in a large carton box. 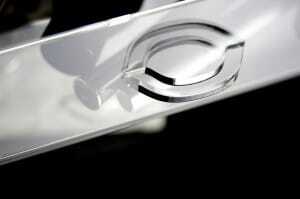 It’s made from strong and durable materials, securely packaged for safe arrival anywhere in the UK. SPECIAL OFFER! – Order Now and receive the 4 Drawer Dividers absolutely FREE! They’re included with your order. AMAZING ADDITIONAL OFFER! – FREE DELIVERY ANYWHERE IN THE UK! You read it right, “Delivery in the UK is FREE!” And, it will be made by a courier company, (such us UPS). Nanshy, we’ve improved upon everything. Oooh this is brilliant – I think I will need one of these when I move house early next year!